iDirect Government (iDirectGov) has revealed their most powerful Major Defense-Based software release, Evolution 4.2 which releases the full capabilities of the 9-Series satellite routers, defense line cards and tactical hub while continuing to support existing 8-Series satellite routers and eMxDx line cards. iDirect Government’s Evolution 4.2 improvements are in performance, efficiency and security in support of the company’s defense and government customers. When used with the 9-Series, Evolution 4.2 boosts single carrier capacity to 29 mega-symbols per second (Msps) (previously 7.5 Msps in Evolution 2.3) as well as 10 times improvement — with achievements up to 64,000 packet-per-second (PPS) of simultaneous traffic. These increased speeds and throughput are ideal for intelligence, surveillance and reconnaissance (ISR) content, larger volumes of simultaneous voice calls as well as other bandwidth-intensive applications for land, air or sea. Significant advancements to the existing multi-frequency time-division multiple access (MF-TDMA) waveform greatly improves the availability of ultra-small disadvantaged terminals, thus improving reliability particularly for Communications-on-the Move (COTM) networks.These powerful waveform enhancements truly allow its new 9-Series airborne solution to take flight. 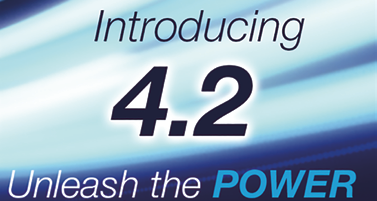 Building upon its existing two-way transmission security (TRANSEC) which is approved by the National Security Agency (NSA), Evolution 4.2 introduces an improved user interface and one-way TRANSEC. This new TRANSEC capability comes with automatic over-the-air re-keying of one-way systems in support of the Global Broadcast Service (GBS). Evolution 4.2 also enables Multi-Protocol Encapsulation (MPE) ensuring backwards compatibility to existing GBS networks as well as Multicast Filtering to remove any duplicate channels. John Ratigan, President of iDirectGov said that Evolution 4.2 is the release their customers have been waiting for. It allows them to continue the use of their 8-Series installation base and expand with the full power and performance of the 9-Series. 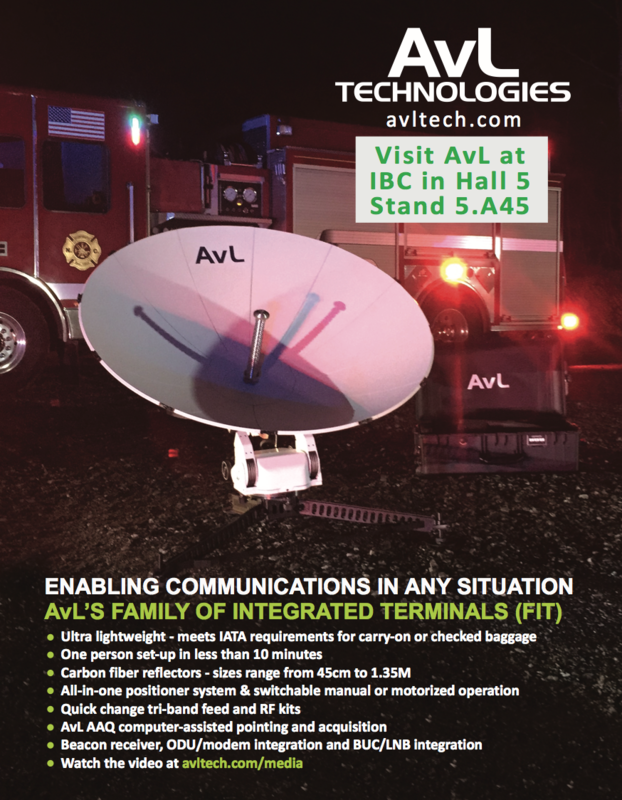 He added that the SATCOM software energizes and elevates both the 8-Series and 9-Series Satellite Routers and line cards, enabling their customers to connect, command and coordinate their critical assets in the field better than ever before. This will result in next-generation satellite communications deployment for airborne, maritime and land-based customers. Harris Corporation (NYSE: HRS) has provided Lockheed Martin (NYSE: LMT) with its fifth of 10 advanced navigation payloads contracted for the U.S. Air Force GPS III satellite program. delivered for the first five GPS III satellites. The GPS III navigation payload features a Mission Data Unit (MDU) with a unique 70 percent digital design that links atomic clocks, radiation-hardened computers and powerful transmitters — enabling signals three times more accurate than those on current GPS satellites. The payload also boosts satellite signal power, increases jamming resistance by eight times and helps extend the satellite’s lifespan. Four navigation payloads have already been fully integrated on GPS III SV01-SV04. GPS III SV02 completed rigorous thermal vacuum testing and is anticipated to be declared AFL this summer. 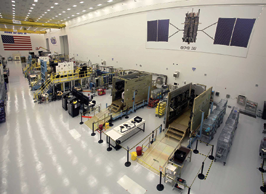 GPS III SV03 and SV04 are expected to undergo environmental testing this year. In November of 2017, Harris announced that it completed development of an even more-powerful, fully digital MDU for the Air Force’s GPS III Follow On (GPS IIIF) program. The new GPS IIIF payload design will further enhance the satellite’s capabilities and performance for the U.S. Air Force. 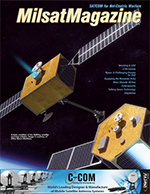 Harris’ expertise in creating and sending GPS signals extends back to the mid-1970s — providing navigation technology for every U.S. GPS satellite ever launched. 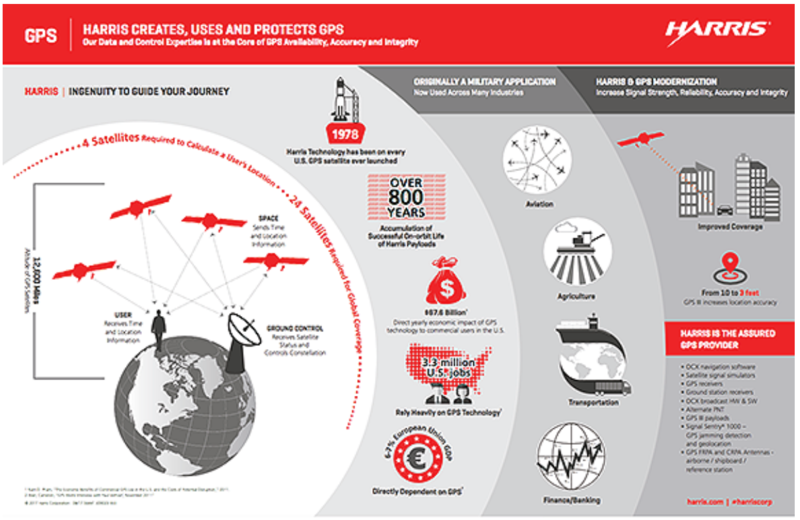 While the Air Force originally developed GPS for warfighters, millions of people around the world and billions of dollars of commerce now depend on the accurate, reliable signal created and sent by Harris navigation technology. An abundance of data and expansion into the cloud and mobile environments present unique challenges for defensive cyber operations (DCO), said members of the Defense Information Systems Agency’s (DISA) DCO Division during a panel discussion at the Armed Forces Communications and Electronics Association’s Defensive Cyberspace Operations Symposium in Baltimore. Army Col. Darleen Straub, chief of DISA’s DCO Division, led the Challenge of Cyberspace Defense and Cybersecurity Service Provider (CSSP) Services panel, which included Robert Mawhinney, chief of the DCO Current Operations Branch; Darrell Fountain, chief of the DISA CSSP Branch; and Paul Barbera, chief of the DCO Plans and Requirements Branch. Straub said DISA stood up a consolidated DCO Division in the summer of 2017. 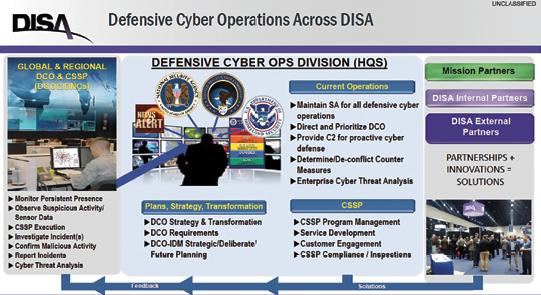 The division plans, transforms, coordinates, synchronizes, and directs the security and defense of the agency’s enterprise infrastructure and the delivery of DISA Cyber Security Services to the Department of Defense. One of the responsibilities of DCO is to monitor, track, and analyze suspicious activity within the Department of Defense Information Network (DODIN). A massive amount of data is trafficked through the DODIN. Ciphering through data, the cost of storage space, the additional volume of metadata and alerts, and the increase of cyber speed — the speed in which the networks are moving and operating — contributes to the continuously changing requirements for DCO. Mawhinney emphasized the need to incorporate artificial intelligence (AI), advanced analytics, and machine learning as part of the cyberdefense environment to provide the initial blocking and tackling of malicious data. “Get that (initial protection) out of the analysts’ hands and let them really start to focus on the cyber kill chain aspects of understanding where to go next,” said Mawhinney. Barbera reiterated the importance of incorporating automated resources that process data and alert the defensive team where to look to find malicious activity. The transition to virtual environments — cloud and mobility — also changes the way operators perform DCO. The defensive framework that previously existed no longer aligns with the functionality of the cloud and mobility environments, and new frameworks must be developed. “We have been working (on a defensive framework for) cloud for four years,” said Mawhinney. When data is hosted in the cloud, separate from the network, there is a disconnect between cyberdefense and direct access to the data. It is difficult to redirect the original data back into the DODIN to be analyzed and filtered for malicious activity, as required by cyber directives. Fountain said his main concern is developing a global defense for the cloud environment. The CSSP established preliminary services to address the DOD’s current cloud need, but further standards and capabilities are required to create an environment that provides the same protection as a traditional enclave scenario used in the DODIN defense. Mobile device use within the DOD doubled over the last year, said Mawhinney, who addressed the challenge of monitoring mobile devices and the mobility environment, adding that mobility is going to be the endpoint solution in a few years. Mawhinney said it is critical that DCO understands how to defend the mobility environment, how to redirect data back into an environment that the DODIN can analyze holistically, and evaluate what is normal or abnormal for data in this environment. Mawhinney also emphasized the importance of incorporating innovative ideas when addressing DCO for the cloud and mobility environments. Viasat Inc. (NASDAQ: VSAT) has acquired Horsebridge Defence and Security, a UK-based company focused on design, system integration and support of deployable secure networks. Through this acquisition, the Viasat UK group gains deeper military communications integration expertise; enabling the Company to continue to grow its business in the UK defense market by delivering mission-critical ground-based communication networks and services. From their UK-base in Cheltenham, Horsebridge Defence and Security have developed robust relationships with the UK Armed Forces, supporting a number of UK Ministry of Defence (MOD) programs. The Horsebridge Defence and Security team will be integrated into Viasat’s already established and growing Farnborough, UK-based organization They will have immediate access to Viasat’s full communications portfolio from the Company’s most advanced satellite communication (SATCOM) and Link 16 mobile networking solutions to its innovative cybersecurity and information assurance capabilities. Horsebridge Defence and Security develops and integrates technologies under their Kestrel II-branded services portfolio. 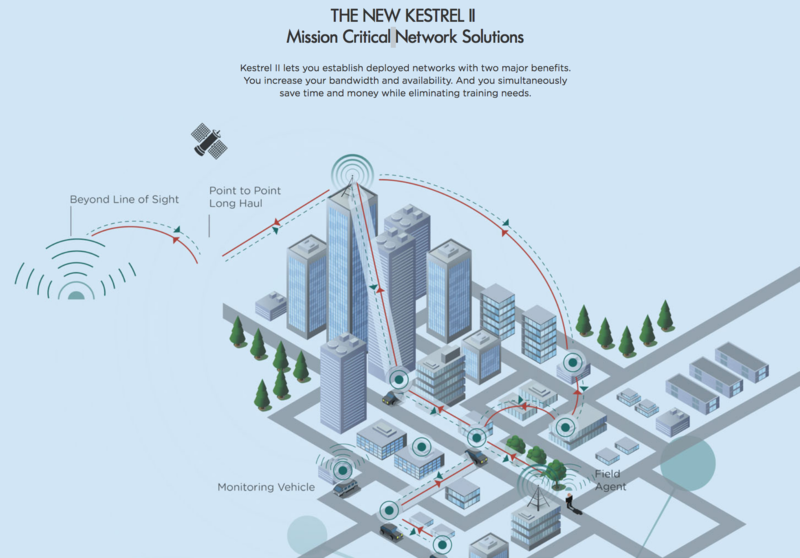 The Kestrel brand has a strong reputation with MOD through successful delivery of a high-capacity ground network for a specific operational mission. The Kestrel II portfolio offers a range of complementary secure network products, solutions and services that are specifically targeted at today’s UK Defence requirements and are continuously integrated and continuously developed (CI/CD) to stay at the forefront of technology. Financial details of the transaction are not being disclosed. The transaction is not expected to materially affect Viasat non-GAAP (pro forma) earnings for fiscal year 2019. However, Viasat has not completed its valuation analysis and, accordingly, has not determined the impact to GAAP earnings. Ken Peterman, the President of Government Systems at Viasat said that, by acquiring Horsebridge Defence and Security, the company hopes to accelerate the trajectory of the firm’s ability to support UK defense operations. Viasat builds best-of-breed technology solutions that leverage commercial innovation; and by combining Viasat’s strengths with the deep domain expertise of the Horsebridge Defence and Security team, the intention is to reliably extend commercial, military or emergency service networks to the tactical mobile edge. Martin Flather, Director, Horsebridge Defence and Security, added that having access to Viasat’s broad portfolio of technologies and capabilities will enable the company to create new secure communications and mobility platforms that leverage high-capacity mobile networks with assured availability — with accredited secure voice, video and messaging services — whenever and wherever military forces require it in the UK or overseas.